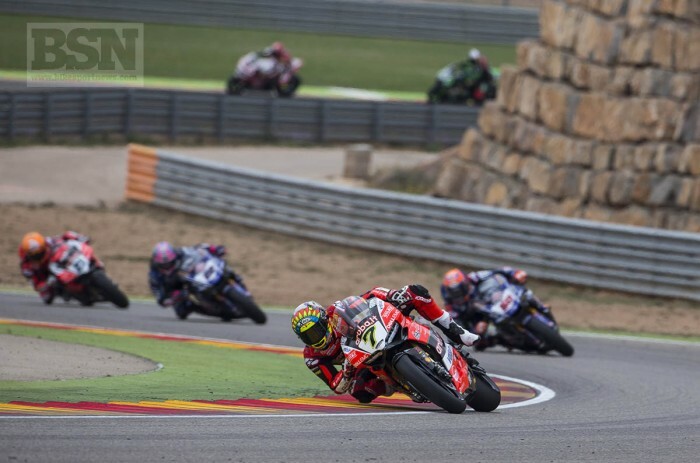 Chaz Davies (Aruba.it Racing – Ducati) won the second WorldSBK race at Motorland Aragon, with a last corner battle only averted after potential winner Jonathan Rea (Kawasaki Racing Team) ran off track pushing Davies’ lead, shortly after another potential victor Marco Melandri (Aruba.it Racing – Ducati) had dropped from a fraction of a second behind, to over three seconds back, after losing his back brake and easing up. Davies, Rea and Melandri had fought it out hard and long in race two but only after leading rider Xavi Fores (Barni Racing Team Ducati) had crashed out on lap eight, entering the fast last curve on the brakes. With five to go Davies made his move on Rea, was rebuffed, but his aggression to repass almost instantly saw him back in front and his win means Rea has to wait to surpass Carl Fogarty and Troy Bayliss on the list of most double wins taken. Rea and Davies had started race two on the third row after being podium men on Saturday. Alex Lowes (Pata Yamaha Official WorldSBK) got the better of Michael van der Mark (Pata Yamaha Official WorldSBK) as they finished fourth and fifth, over ten seconds down. Tom Sykes (Kawasaki Racing Team) had a disastrous second race, running in the midfield and finally recovering to finish sixth, but 13.7 seconds from the winner. Michael Ruben Rinaldi (Aruba Racing IT Ducati Junior Team) almost lost a fine seventh by celebrating too early over the line, with Jordi Torres (MV Agusta Reparto Corse) only just eighth. In the championship itself, Rea has 114, Davies 102, Melandri 96 and Fores 76 points.